Marine art by Gordon Frickers 50 x 81 cms (20″ x 32″), oils. Many of my paintings are commissioned for presentations, gifts etc by companies, this powerful study in oils, 20″ x 30″ was commissioned by former deck officer Claude Picault to be a family heirloom. Gordon Frickers, artist and sailor has a long experience of working with professional sea people, they speak a common ‘language’. 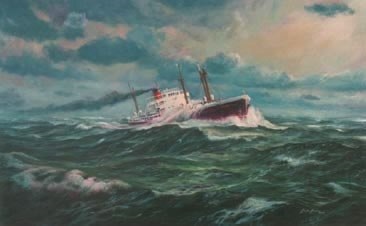 A back handed compliment, this splendid original painting of a Liberty class ship in heavy weather, a private commission for a French friend, a former deck officer on board Trun working for the Companie Generale Trans-Atlantique, he told me was told me stolen from his Hotel Bellevue, Sicily. Be sure to always insure any ‘Gordon Frickers’ paintings you have. The LIBERTY ships became the largest single class of merchant ships ever built. Liberty ships had an exaggerated reputation for breaking in two in cold heavy weather and heavy seas, just for’ard of the bridge; this painting nicely illustrating the risk. That said, many Liberty ships were still working well into the 1970’s. The Liberty ships were a development of a British design, built in the USA as replacements for the very heavy losses, mostly due to U boats, the record built time was less than a week from keel laid to launching. It was considered, if a Liberty ship survived one voyage they had paid for themselves. Despite the fast building these fine ships developed from proven designs proved very popular with their crews who regarded them as luxurious compared to their forerunners. The Liberty class ship illustrated here, originally named “Meyer Lissner” was sold to France after W W II to become “Trun“, de la Companie Generale Trans-Atlantique. This painting was last heard of reported stolen with one other, a beautiful study of of his yacht “Nizou IV“, shown with the Picard family aboard, home port to loo’ard, and Sicily with it’s famous volcano in the background from Hotel Bellevue in Sicily.